‘Hallux’ is Latin for the big toe. 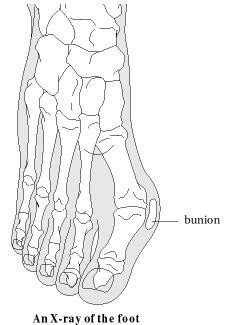 In the case of a bunion the big toe grows in the direction of the little toe (=valgus). This growth is accompanied by a bony lump on the inside of the base of the big toe (=bunion), which is caused by the deviation of the metatarsal bone from the big toe inwards. The joint around which this occurs is called the MTP (Metatarsophalangeal) joint. Besides the joint, there are changes in the soft tissue; we observe elongation of the capsule, ligaments and muscles on the inside and shrinking/contraction of the structures on the outside. Shoes are the main external factor that influences the formation and development of a bunion. The main culprit concerns women’s shoes that are frequently too narrow (research has revealed that on average they are two centimetres too narrow for the foot), plus the fact that they often have high heels, which increases the pressure on the front of the foot. Women are nine times more likely to suffer from a bunion than men. This could be partially attributed to hereditary factors (studies revealed that 60% of cases run in the family) but fashionable women’s shoes are also responsible. We roughly differentiate between two types: juvenile hallux valgus, if it forms before or during puberty. And the adult hallux valgus, if it forms later. The pain is most frequently located at the bony lump. The bunion starts to become inflamed (bursitis or bursa inflammation) and feels red hot and extremely painful. The size of the bunion is not always decisive for the degree of pain suffered, people with a relatively small bunion may experience severe pain and can no longer comfortably wear shoes. In addition people complain about pain in the joint at the base of the toe or above or below the second toe. The problem of wearing shoes or the appearance of the foot often constitute recurring complaints. Avoiding narrow shoes and high heels (preferably lower than 3 cm). Always try and buy shoes made from soft leather, and if possible, allow the shoe to stretch over the bunion. Take care that there is no seam along the area affected by the bunion (this will cause irritation and all the associated discomfort). Shoe inserts: These are certainly recommended in cases that also involve flat feet (=pes planus) or metatarsalgia complaints (=pain in the ball of the foot). Please note: they also reduce the amount of space in the shoe! Night splints: It is important to know that they do not correct the condition, they may be used to prevent the juvenile form getting worse. It is important to know that there is no ‘standard operation’ for bunions. The method used will depend on, for example: any underlying anatomical defects, such as osteoarthritis, the severity (degree) of the defect, age and level of activity of the patient. We can divide the procedures into four large groups; combinations of these techniques are often applied. Repairing the soft tissue: this mainly involves correcting the stretched/shrunk structures around the MTP joint. Osteotomy: this involves breaking the toe, after which it is straightened again and fixed with screws. Arthrodesis: this involves removing the MTP joint and immobilising the remaining bone, with the aim of the big toe and metatarsus growing together in a corrected position.